Gerald G. Jampolsky, M.D. is a Child and Adult Psychiatrist and a graduate of Stanford University School of Medicine. In 1975, he founded the first Center for Attitudinal Healing, in Tiburon, California. Now there are independent Centers for Attitudinal Healing throughout the world on five continents in dozens of countries, offering free services for children, adolescents and adults. Diane V. Cirincione, Ph.D. is the Founder and Executive Director of Attitudinal Healing International. She is also a therapist in private practice, a businesswoman, author, and international lecturer. Drs. Jampolsky and Cirincione are married and are members of the faculty of the University of Hawaii School of Medicine, Department of Complementary and Alternative Medicine. Together and independently they have authored several bestselling books. Over the last four decades they have been invited to work together in over 60 countries and are recipients of numerous international awards. In 2005, Dr. Jampolsky also received the Excellence in Medicine – Pride in the Profession Award, from the American Medical Association, for his lifetime humanitarian service and for his contribution of Attitudinal Healing to the field of health. In 2015 both authors were awarded the Ellis Island Medals of Honor for living lives dedicated to helping others and sharing their personal and professional gifts for the benefit of humanity. Articles by Gerald Jampolsky, M.D and Diane Cirincione-Jampolsky, Ph.D.
We have known for about three years that we would be going to Cuba. It was just a matter of who would be guided to invite us and when, since just about all of our work is “scheduled” in that way — someone “listening” to their Guidance. Sure enough, in November 2002, we were asked to come to Cuba to give lectures on Attitudinal Healing and the time agreed upon was May 2 -May 9, 2003. It was not until we arrived in Havana that we discovered the details of how our invitation came to pass. It was a journey filled with love and miracles and where every step seemed to be a sacred one including the first one, which actually occurred in 1981. This priest became interested in Attitudinal Healing and began to apply it in every part of his life. For example, he mentioned that a woman who had been coming to confession to him for over twenty-two years always spoke of the guilt of a certain traumatic situation. She found neither peace nor consolation. After the Priest got a grasp of what Attitudinal Healing was all about, he was able to help her let go of her guilt and to stop hurting herself. She laughed and said, “I finally got it.” He was so moved by her shift that he dedicated himself to incorporating the principles of Attitudinal Healing into his homilies as well as his counseling. Years later, he got a copy of A Course in Miracles which has deepened his use and practice of what he offers. In 1993 a friend of the priest had her life changed by Attitudinal Healing and she began reading the Course. That year, she wrote Jerry a letter, but never got a reply. Six months ago (ten years later), and much to her shock, she found the letter in her home, unsent. She decided to mail it anyway and, of course, she received a reply right away. The both of them then extended the invitation to us. The people of Cuba could not have been more loving, gracious and kind. There are many challenges there, as many families have to live on $7 to $20 per month. For many, the future has a bleak reflection of the past, which feels doomed to repeat itself. Their lives are filled with many frustrations and challenges, which they often attempt to meet with creativity and even humor. We gave seven lectures. The lectures had between fifty and four hundred people and were always at the venue’s capacity. We learned that many others had been reading our books over the years and were meeting in groups to discuss them. The end result of the trip was a new Center for Attitudinal Healing has started in Havana and one in Santiago de Cuba too. They both are connected and support each other. Our discussions included how it is only our own thoughts that hurt us and that we can choose not to be a victim in the present because of what did or did not happen in the past. We pointed out how forgiveness helps us let go of the painful past and how it helps create a future different from the past. Many of the people had read our books in Spanish and were already conversant with the principles of Attitudinal Healing. We visited the home of a family that had a twelve-year-old son that had been completely paralyzed since the age of four and was not able to speak. The father said he was like a vegetable. We complimented the family for the wonderful love and care they had given their child all these years. We reminded them that they could always choose to see their child, not as a body, but as a Light; not just as a burden, but as a gift of patience and unconditional love. In doing so they would find peace. We also reminded the family that their child was in their lives to bring them closer to God. And that it was possible for them to see their child as a special messenger of God teaching them infinite patience. We stated that the biggest gift they could give their child was their peace and their love. The energy in the room was transformed into a powerful experience of love, joy and peace. The parents came to our lecture that night and looked like different people. Our dear friend, Dr. Alberto Loizaga, not only lectured with us, but he also translated for Jerry. He did a great job. After the first night that we lectured in Santiago de Cuba in the south, he shared with us what happened to him during the lecture. Jerry’s response to Alberto was one of amazement. Jerry told Alberto that if he had diarrhea on stage, he would have excused himself in the middle of the lecture and gone to the bathroom. Jerry then went on to share his deep respect for Alberto and said, “Alberto, you must have done this lesson, ‘I am not a body. I am free,’ perfectly because I was standing right next to you and I didn’t smell a thing. I can experience peace of mind even when there is chaos going on all around me. It is our interpretation of the Course that underlying all conflict and stress, is an unforgiving thought. But we have egos that constantly tell us that the cause of our distress is from our external world. We are constantly bombarded, when we listen to the voice of the ego, that the cause of our distress is from external stress. When we listen to the ego voice and believe what we hear, we end up believing that our exhaustion, fatigue, and burn-out comes from long hours of work, bad working conditions, marital discord, parent-child conflicts, worry about terrorists, financial insecurity, and all aspects of “not having enough,” just to mention a few. The Course would say, “It is only my own thoughts that hurt me.” Our egos would say, “In this situation, that is not true.” An example we like to use is that of a social worker who comes home at 7:30pm everyday dog-tired. Many people have been let go where she works, and now she has many added things on her plate. She is angry at the situation. She is worried that she may be the next one to be let go. She comes home dragging her tail and decides to vegetate. She skips dinner and decides to go right to bed. She feels totally exhausted and depleted. She remains angry at her boss and the world. She feels what has happened is not fair and unforgivable. She decided to escape from the world by watching television. Then the phone rings, and it is her best friend calling. She has just flown into the airport and has four hours till she makes her next connection and wants to know if they can get together at the airport. The social worker is delighted to hear her friend’s voice, and says that she will get dressed and will be there in forty minutes. She is taking a shower, singing a tune, full of energy and joy. So what changed here? Her body didn’t change. What changed was her attitude about her body. That did change. So much of our fatigue, exhaustion and burn-out is caused by our mind-set. The toil of our unforgiving thoughts is tremendous and plays a major role in burn-out. When we commit ourselves to making forgiveness as important as breathing, we become vigilant in practicing forgiveness every second that we are in this illusory world. Back in the 80’s, Jerry was consulting with a large company called The Harper Group. Jerry met with the Chief Executive Officer, John Robinson, once a week. At that time, John attempted to control people through fear and attack. For example, if they failed to make their anticipated budget, John would attack them and make them feel guilty as a way of changing their behavior. Jerry brought in spirituality by suggesting that he might want to choose to see the errors of employees as mistakes, something to be corrected rather than as a sin that needed to be punished. John chose to do this and the morale and productivity of the company immediately went up. John was later even able to talk about his own mistakes with others, which encouraged them to feel safer at being vulnerable. A more caring and loving attitude in the company resulted. Another example is that one day John came into Jerry’s office stating he was going to be meeting with a hostile group of stock owners that day. John had been meeting with his lawyers and they had developed with him some defensive maneuvers. Jerry suggested the lesson from the Course, “In my defenselessness my safety lies.” Jerry suggested that John might want to just tell the truth and not keep secrets from the stockholders and maintain his integrity. John decided to do just that and it turned out to be a very peaceful, productive meeting. John drove in a limousine and kept a three-by-five card with the lesson Scotch taped to the back of the front seat. A month later the president of an airline was driving with him in his car and asked what the card meant. John explained it and told him of the story with the stockholders. His friend said, ” I am facing a similar problem with my stockholders. Can I borrow your card?” He later called John to thank him and stated the meeting was excellent. More recently, business people have taken an interest in spirituality in the business environment. Perhaps some of the reasons for this new interest are the new facts about the cost of stress to a company. Most organizations have no idea how much employee stress costs them each year. Don Goewey, the Executive Director of the International Center for Attitudinal Healing, has researched this area and came up with these facts. 40 percent of job turnover is due to stress. 60-80 percent of accidents on the job are stress related. California paid out almost $1 billion for medical and legal fees alone, and double digit increases in Worker’s Compensation premiums every year as result of mental stress claims. The number of employees calling in sick because of stress tripled from 1996 to 2000. Unanticipated absenteeism is estimated to cost American companies $602.00 per worker per year and the price tag for large companies could approach $3.5 billion per year per company. In an effort to meet this growing problem, Don Goewey and the Sausalito Center Staff have created a workshop for business people titled, “Attitudes That Mean Business.” The first such workshop was held at Dominican College in San Rafael, California in October 2003. Seventy-five people attended and it was extremely successful. More workshops will be offered in 2004. The twelve principles of Attitudinal Healing which Jerry borrowed from the lessons in the Workbook of A Course in Miracles were discussed. There were many experiential dyads throughout the day particularly around forgiveness. The workshop avoids religious words such as Holy Spirit and Christ and does its best to language the presentation in a way that it would be generally acceptable to people in business. When our Center started in 1975, business people would not have related to the word “love” but today it is now an acceptable word. “Compassion” and “caring” have also become acceptable words to use. For us, we still stand in awe about how the principles of the Course can be used in very practical ways in every aspect of our lives. We write this in early 2003 at a time when from our Government’s standpoint, it is quite probable that we will be involved in a war in Iraq. Much of the news media states that President Bush is determined to attack Iraq, regardless of whether or not the inspectors find anything or our country’s allies agree. The most recent poll taken indicates that while 72% of Americans don’t support a war with Iraq without United Nations support, the majority of people feel that war is both imminent as well as inevitable. With the war drums from the White House and their reverberations in the media, it’s easy to fall into the trap of believing there is an enemy out there and the enemy is Saddam Hussein. War is proclaimed as the only rational answer that will bring us to peace. With the present crises in Iraq, North Korea and between Israel and the Palestinians, it is tempting to externalize everything and to throw up our hands and say, “The world has gone mad and there is nothing I can do about it.” The afteraffects of this misperception are increased feelings of fear, hopelessness, helplessness and apathy. During this time of terrorist attacks, financial and every other kind of uncertainty, our egos act like magnets sucking us into the darkness that we see and then feeling like we are becoming part of it. Our egos then have us living in a heightened state of on-going fear. From this perspective of the ego self, it is easy to believe that there is only an “outside” war going on, not an “inside” one. These circumstances are an opportunity to put all our energies into finding someone to blame, creating an enemy “out there,” and feeling war is justified. One of the many things we love about the Course is its practicality. We would like to share with you our understanding of how an aspect of the Course applies to our present world situation, regardless of your political affiliations. Our interpretation of the Course says that the world we see with our physical eyes is indeed insane, that there is no enemy, there is no one to blame. There are no evil monsters out there. It states that we are never upset for the reasons we think. It would point out that we have split minds that we keep hidden from our conscious self, that what we see in others is a projection of something in ourselves. In many ways the Course states that happiness and peace are our natural state of mind. The real problem is not in the external world that we see. The real problem is not the Middle East, North Korea or Iraq, but instead that we have separated ourselves from a Loving God and have created an ego mind with the core of guilt that keeps us in the illusion that the world we see is real. These are essential times to review and believe the writing of the Course’s Introduction, which says, “Nothing real can be threatened. Nothing unreal exists.” Our problem is that we are tempted to believe that the illusion of separation that we experience is real and that our joining with others is threatened. How do we practically apply the lessons of the Course to the present situation? If you are anything like us, there are those moments when the lessons of the Course go out the window. We lose our vigilance to our spiritual path, go into the sleep of forgetfulness, and give permission to let our egos take over. To go into more detail, there are mornings when we end up shouting at the television as we hear administration personnel tell us that war is the only answer. Then, thankfully, we catch ourselves and we wake up to recognize President Bush and everyone else we may disagree with are our brothers and sisters. They are us. They are projections of our own split mind. When we find ourselves in that insane state of mind, we start the day over and become more vigilant in reminding ourselves that there is no enemy; there is nothing to fear. We then do our best not to feel guilty when we forget who and what we (and they) really are. Following this, it is our intention to become more consistent on healing our own mind of the guilt, blame, and self-condemnations of the past. We then concentrate on living in the peaceful present and extending that to the future so the present and future become one. It is important to understand that “being” is a very active phenomenon. When we empower ourselves to open our hearts to experience the power of God’s Love, we remember that we are the vehicle for God’s Love, and Love goes everywhere and touches everyone’s heart. We are, indeed, one joined Mind. We are then dealing with the solution rather than the problem as we reach to a Higher level of Power. We do our best to ask Holy Spirit to give us guidance in what to think, what to say, what to do, and whom to meet. There are times we hear, “There is nothing you need do, just be.” There are other times that our Guidance directs us to take part in the peace-filled demonstrations in San Francisco, also held in many other cities around the world. Our Guidance has been not to be drowned in the sea of apathy, but to let our voices be heard from the place of love instead of fear; peace instead of conflict. We have sent letters to members of Congress and the President about our viewpoints. We have also sent money and membership fees to organizations supporting a non-violent, spiritual, and peaceful solution to our problems such as Marianne Williamson’s excellent Global Renaissance Alliance at www.renaissancealliance.org. There is a season for peace and non-violence from January to April, between Martin Luther King’s and Gandhi’s birthdays, spearheaded by our dearest of friends, Barbara Bernstein, (agnt2000@aol.com) who is Executive Director of the Association of Global New Thought. Our guidance has been to support this season of peace and non-violence during this last year and half and there are now dozens of cities that are using information packets based on our www.ForgivenessWorks.org project to create forgiveness gardens and create forgiveness projects in their communities. A most practical way for us in dealing with the events of the world today is to go back to the last paragraph of Chapter 16 in the Text. It is our belief that we would all be doing our part to heal the world and ourselves if each of us made heart and mind prints of this section. In our opinion, it is perhaps the very best way of dealing with all the ego temptations that try to attract us with the events of each day. From our standpoint, A Course in Miracles creates a way of leading us out of hopelessness, helplessness, pain, despair, and war. As we choose to listen to God’s Voice, not the ego’s, we become empowered with a Healing Force that we are convinced is beyond our imagination. As we heal ourselves from our split minds that separate us from God and each other, the world we see will be different and forgiveness will be the last illusion that will lead us to be forever joined in the real world of God’s Love. Over twenty years ago we were befriended by Janet and Hiroshi Ouchi and their family from Japan. Throughout the years Hiroshi, a university professor, has been our interpreter while in Japan as well as the translator of many of our books into his native language. The most recent release was Forgiveness: The Greatest Healer of All, which has become very popular there. As a result, the Ouchi’s have been doing powerful workshops on Forgiveness, based on the book and they recently shared the following with us. A woman in Japan (who we will call Saira) sent a letter with the following story. Saira said that her life had been full of misery throughout the years and every step of the way had been very tough for her. In her letter, Saira stated over and over again how she had always been treated very badly by everyone else. As a result, she was so depressed that she couldn’t bear to live any more. This feeling had been going on for many, many years as her anger and depression continued to deepen. Recently, the letter stated, she had decided to commit suicide by poisoning herself with a poisonous plant. So Saira went to the bookstore to find information that would help her learn about the poisons and to find out what amounts would kill her. It was then that a so-called “accident” occurred. While she was looking for this book, somehow she came across Jerry’s book, Forgiveness: The Greatest Healer of All. One could also call it “Divine Intervention”. We like the statement that a coincidence is a miracle in which God wishes to remain anonymous. She purchased the book, took it home and read it. During her reading, she saw for the first time the possibility of living her life in a different way. Other people did not need to change in order for her to find happiness; only her own thoughts needed to heal. She somehow knew that if she could forgive, her life would be different. At first she saw it only as a concept, an idea, but then she became eager to find out how she might do this. Saira wrote a letter to thank Hiroshi for his translation of the book into Japanese. She then heard back from him about a workshop that he and Janet were going to conduct on the subject of Forgiveness, based on the concepts in A Course in Miracles. Saira attended the workshop and began to learn how we need Divine Assistance in forgiving because to forgive is the last thing the ego wants to do. At the end of the workshop, people were asked to look at their life and see their abundance by seeing themselves as the essence of love. Saira was feeling abundance in her new found freedom and was guided to contribute $10,000.00 to her favorite charity. The story of Saira is a wonderful example for us all. So often we are not aware of the personal damage we cause ourselves in living a life of blame and feeling that we are not worthy of love. And too often we are not aware that when we feel our peace and happiness is dependent on another person changing their attitude, we will live a life filled with conflict, anger and hate, where love is nowhere to be found. From our viewpoint, A Course in Miracles is about cleansing our perceptions so we can truly know once again that Love is our only reality. It is about letting go of our judgments and self-condemnations. It is about taking responsibility for our own happiness. It is about reminding ourselves that forgiveness has nothing to do with changing the other person and that forgiveness occurs when we have a willingness to give our anguish and anger to God. It is about healing the illusion that we are separate from God and each other. At the time of writing this article there is a war going on with Iraq. It is a time where we are challenged to be peaceful even when there is such horrendous chaos going on all around us. Let us remind ourselves that the world of form that we see is one that constantly changes. Let us remind ourselves that this is not the real world, but the world of the ego that we have invented and that nothing real can be threatened and nothing unreal exists. Therein lies the peace of God. I, Jerry, first met John Johansen and his wife, Barbara, their son, Paul, and their daughter, Kathleen, some twenty-five years ago. Diane became very close to the Johansen family some time later. When I first met Paul, he was fourteen years old and had a virulent form of cancer. Paul lived in Connecticut and we first met on the phone. I knew immediately that there was an ancient, wise and spiritual teacher living inside this boy’s body. Paul had come close to death and was in the process of dying in the hospital — he was on a morphine drip. He was not able to eat and could hardly talk. Then, as Paul described it to me, he had a most significant dream. He dreamed that he was having a conversation with God. He was asking God for a little more time — for he had more to teach others about living and dying. God replied that he would be given more time. The next day, to everyone’s amazement, he asked for a Big Mac Hamburger and gradually got somewhat better. Paul visited our Center and I continued to have close contact with him and his family. Later there was a conference on death and dying and Paul agreed to be on the program with me at Columbia University in New York. He was a powerful teacher to all the professionals sharing with them his journey. Still later the television program 60 Minutes came to me wanting to do a program on our Center for Attitudinal Healing in Sausalito, California with its work with life and death issues. I suggested that two of the people they might want to focus on were Paul Johansen and another boy named Tony Botterin in California who had cancer of the leg. They were both supporting each other on the telephone as a part of our Person-to-Person Support Network. 60 Minutes did a great program. It was shown not only in the United States, but in Australia, Germany and in Russia when I was visiting there. And then I remembered his dream again . . . that he just wanted to be given a little more time to help others. Paul died sometime later. I realized his dream was miraculous. It was awesome that in the time he was given he taught millions of people about loving and caring through his appearance on 60 Minutes. As often happens, when you work with a family whose child is dying, in a very beautiful way, you become bonded with that family for life. We have kept in close contact with each other throughout the years. In a wonderful way, Kathleen, Paul’s sister, describes me as her other dad. It has been a blessing for me to be there for John, Barbara, Paul and Kathleen during the peaks and valleys of their lives. I spoke at Paul’s funeral twenty-four years ago. I spoke at Kathleen’s wedding in the same church in Connecticut six years ago. John Johanson died suddenly and unexpectedly September 8, 2003 and again, I spoke at that same church for his funeral. I flew from Hawaii to Connecticut to speak at John’s funeral. Like me, John’s spiritual teacher was Paul. What he learned from Paul was the passion of helping others. It was then that his light glowed and peace came to him. There were so many occasions that I phoned John and asked his help at helping a father whose child had just died. He was always so helpful. The healing of a child’s death is never easy and Paul was always in John’s mind and in his heart. John had many ups and downs in his life since Paul’s death. But what I admired most about John was his commitment to God and his willingness to bounce back and give his worries and self-criticisms to God. John and I became brothers to each other in every way that the word brotherhood implies. There is a wonderful lesson in the Course that John and I would often discuss together: “I walk with God in perfect Holiness.” It is my belief that John walked with God in perfect Holiness when he was in earthly form, and that he continues to walk with God in perfect Holiness now and forever more. I will continue to feel his presence in every sunflower (our favorite flower), in every sunrise, sunset, and in every rainbow. Within my heart I knew that John wanted my talk to be lighthearted and full of joy. He had a marvelous sense of humor. My flight had a three-hour stopover in Chicago. So, at 6:00 a.m., I found a place where I could get an orange juice and I sat down at a table. An incident then occurred that I feel John produced, directed and acted in. What happened was this: I took out a pad of paper and began to write a few thoughts about John that I could share at the funeral. But I was hard put to think of anything humorous to say. I finally started to talk to John and said, “Okay, John, I need your help again. If you want me to say something humorous I would appreciate your help right now.” I was not prepared for receiving an immediate response. My nose was close to the paper and I was concentrating hard when someone went by me whom I did not see. I just saw a man’s hand drop a napkin on my paper with a handwritten note. The printing was so small that I had to get my glasses out to read it. There were just four words. It read, “Your fly is open.” I immediately looked down. After quickly zipping up my pants, I looked around to see if I could see the person who left the note, but he had disappeared. I only had the visual image of a hand and the napkin with the note. And then I began to laugh and laugh and laugh. In my mind, that was John’s hand, being as always, kind and helpful, and getting me out of a possibly embarrassing moment. I also believe that John was giving me some material for the funeral that would make people laugh. And yes, people howled at the funeral and appreciated the humor. I believe that John has now joined Paul in becoming my guardian angels. I thank you, John, for being such a loving friend and for inviting me to be such an intimate member of your family. On March 11, 2004 we had a most powerful learning experience that helped reinforce some of our beliefs. We gave a talk on our book, Forgiveness, The Greatest Healer of All at the Hawaii State Hospital located in Kanehoe, Hawaii. There were about seventy people in the audience. Half of them were patients with mental illness and half were members of the staff. Before we began, there was some entertainment. A Hawaiian man with a beautiful falsetto voice played the guitar. He accompanied seven women from the local “halau” (a Hawaiian dance group) who performed hula with a most sacred quality. The unique composition of the halau was that it included both residential patients as well as staff members. What was fascinating to us was that it was impossible to tell who were the patients and who were the staff members. It felt to us that they were all one family without any categorizations. Now we knew that many of the patients had been at this hospital for years with a variety of diagnoses such as Schizophrenia, Manic Depression, as well as various other diagnoses for mental illness. Some had committed violent crimes and were there for forensic reasons. But in this situation the costumes of their diagnoses and the labels of who they were was not evident. What was evident was the energy of the Light and the Essence of love in everyone’s heart. It was like a homecoming for Diane for she had been an intern at this hospital in 1995/96 and felt her experience at this hospital was one of the most important learning experiences of her life. When Diane started her internship, she decided not to look at the patient’s charts before she met them. She decided to see them as either loving or fearful giving a call of help for love. The rapport she was able to establish was amazing. For example, one person who had been mute and not talked to anyone for years, began talking to Diane. He was gradually released to his family and has not returned to date. Diane decided to start an Attitudinal Healing Support Group when she was at the hospital. She was told by many staff members that patients would either not attend or would fall asleep during her sessions due to limited attention spans. Diane was very clear with her group that they were her teachers as much as she was their teacher, and that she was there to find healing for her self as well as for them. Patient attendance was 98% for 9 weeks. They were alert and not only participated actively, but helped her design the course. It was repeated again in the second half of the year. There is now a new Attitudinal Healing Support Group being formed by Pat Thielen who is Director of Social Services and a founding member of the Honolulu Center for Attitudinal Healing. We both have often said that perhaps all of us are equally insane, and that it is only our form that is different. Perhaps if everyone could look inside of each of our minds to see all our thoughts, we might all fall under the diagnoses of being psychotic. If we would believe in that definition, it would mean that most of us are insane most of the time because we are so busy making judgments and holding grievances on others as well as ourselves. Our judgments block our awareness of love’s Presence in our lives. We believe that true healing has to do with healing the illusion that we are separate from each other; that we are all brothers and sisters to each other with one joined mind. In the presentation we gave on forgiveness we pointed out that one of the main problems that everyone living in this world has is in choosing to forgive or not to forgive. We talked about the challenges that staff people have at work and at home and the similar challenges that the patients have and that we as a married couple have. If we take our costumes and categories away, we are very much alike. We then each gave examples of some of the challenges each of us have had in forgiveness. We talked about some of the principles of forgiveness and then asked the audience to participate and tell us what they felt some of their own resistances were about forgiving. The participation was quite lively and there was a feeling of oneness as members of the audience began to share their experiences. We were left with more conviction than ever before that if the insane world that we seem to look at is ever to change, it will change by each of us healing our own minds so that we can live a life of love and forgiveness and see everyone as our brothers and sisters . . . or even better yet, as our Siamese Twin. We are not saying that diagnoses don’t have a place. The problem, however, is that many of us get stuck on the categorization, the behavior and the symptoms, and fail to see the total human and spiritual being that is underneath the behavior. As we have the courage to take off our own costumes, we are better able to see past the costumes of others. A story that Jerry has told before about categorization has to do with a cocktail party in New York City that he had been invited to, hosted by Judy Skutch Whitson. Jerry really did not want to go to a cocktail party and end up talking about superficial things. He finally gave in and went to the party a little late. There were many people. He saw an empty couch and went to sit down when another man sat down at the same time. Judy then introduced the man as Byron Janis, a famous musician. Jerry told them both that he liked music but did not consider himself an expert, and that if he had known Byron was a famous musician he would have probably disappeared somewhere into the woodwork feeling inadequate to converse with him. They all had a good laugh as they recognized that if they had been introduced to each other with their “costumes” showing, they would probably not have spent any time together at all. It was a most powerful learning lesson. Have you ever thought how often you ask a person upon meeting them, “What do you do?” What frequently follows is a judgment on this person and a decision if you want to talk further. So many of our questions lead us to judgments. Perhaps rather than categorizing people and then making judgments on them, we can do what Diane did as an intern. She made a decision to see the Light in everyone, to see the Essence of Love in everyone including herself and to see everyone as teachers of forgiveness and love. We recently received the following story from an unknown source on email from our dear friend, Hugh Prather. We wanted to share it with you. Many of the waiters at his restaurant quit their jobs when he changed jobs, so they could follow him around from restaurant to restaurant. The reason the waiters followed Harry was because of his ATTITUDE. He was a natural motivator. If an employee was having a bad day, Harry was always there, telling the employee how to look on the positive side of the situation. Seeing this style really made me curious. So, one day, I went up to Harry and asked him, “I don’t get it! No one can be a positive person all the time. How do you do it?” Harry replied, “Each morning I wake up and say to myself, I have two choices today, I can choose to be in a good mood or I can choose to be in a bad mood. I always choose to be in a good mood. Several years later, I heard that Harry accidentally did something you are never supposed to do in the restaurant business: he left the back door of his restaurant open one morning and was robbed by three armed men. While trying to open the safe, his hand, shaking from nervousness slipped off the combination. The robbers panicked and shot him. Luckily, Harry was found quickly and rushed to the hospital. After eighteen hours of surgery and weeks of intensive care, Harry was released from the hospital with fragments of the bullets still in his body. I saw Harry about six months after the accident. When I asked him how he was, he replied, “If I were any better, I’d be twins. Want to see my scars?” I declined to see his wounds, but did ask him what had gone through his mind as the robbery took place. Harry is a wonderful example of what Attitudinal Healing and A Course in Miracles is all about. From our perspective, Harry was not using positive thinking, but was involved in Spiritual Thinking and Godly Thoughts. To paraphrase, this lesson states that God is my home, wherein I live and move; the Spirit that directs my actions, offers me Its Thoughts, and guarantees my safety from all pain. We have found this lesson a most gentle one that allows us to live above the drama of our everyday lives. When we remember God and keep the name of God on our lips and on our minds, the Peace of God is experienced. The temptation to make interpretations, make judgments and assumptions seems to disappear into thin air. We found Harry as a wonderful example of how each of us can choose differently by choosing the Peace of God as our only goal. People like Harry are happy because they remember that happiness is their natural state and that we have endless choices as to how we are going to experience each and every day, regardless of what actually happens. Harry was peaceful and happy even amidst the chaos going on around him. He was peaceful and happy because he saw the value in letting go of the negative past and the value of forgiveness as the key to happiness. We have been blessed to know that we are messengers of God and that every person that we meet is a Holy Encounter for ourselves. The Holy Encounters we have had with taxi drivers has been truly miraculous. We have learned that a taxi driver’s life can be changed in a forty minute ride to the airport, and that our lives can be enriched in magnitudes beyond measurement. We remember one incident when we were going to the airport after attending Miracle Distribution Center’s A Course in Miracles International Conference. After getting in the taxi, we softly recited our version of the Healer’s Prayer from the Course. He was born in Italy and had been married for thirty years. He stated that the last two years has been like living in hell. The driver went on to say that his wife is all the time criticizing him and complaining just about everything. He stated he has done everything to try to get her to change, but to no avail. He was sick and tired of it and had made up his mind to leave his wife this coming week. The Course states that you teach what it is that you want to learn so here was our golden opportunity. We asked him if he had ever considered changing his own attitude, rather then spending all his energy trying to change his wife’s attitude? We suggested that rather than seeing his wife as attacking and complaining, he might choose to see her as being fearful and giving a call of help for love. We went on to say that when we see someone as fearful calling out for help, our heart opens up to them instead of defending ourselves which is really a return attack in disguise. The driver became intrigued in this new way of looking at his wife. We then talked about counting his blessings rather than his hurts and opened up a discussion on forgiving others and ourselves. He mentioned many things for which he had not forgiven himself. When we were at the airport, he clearly wanted to continue the conversation, but we had to catch our plane. We got his name and address and said we would send him a couple of our books. A month later we received a long letter saying that the ride to the airport had changed his life, saved his marriage, and how very grateful he felt. Six months later, the same driver showed up at the International Center for Attitudinal Healing in Sausalito looking for us. We happened to be in town at that time when the Center called us on the phone. We were free and immediately came there to witness a man who had changed his mind and, thus, changed his life. We continue to learn that there are no accidental meetings and coincidences are God’s way of remaining anonymous. When you believe in miracles and actually expect a miracle, healing can take place in a relatively short period of time, even in an instant. We are writing the article on October 1, 2004 on a plane from Honolulu to San Francisco. A woman taxi driver brought us to the airport. She was a beautiful, natural, large-boned woman who told us she was from Samoa. We found out that her biggest worry was her six children. She lived in an area where there was a high use of drugs and she was fearful that her children would succumb to drugs or crime. She was one of thirty-seven children. Her father had many different wives and was an alcoholic. Most of her siblings have had a hard time, but she has stayed away from drugs and alcohol. She now lives in a house with her husband and their six children, where her family and sister’s families are intermingled. Her mom takes care of the kids when she drives the taxi. Her biggest problem is around forgiving her sister who continues to make negative remarks to her about being a “goody goody” kind of person. We spoke to the driver about our impression of how difficult it must be, as a concerned mother, to deal with the life situations that she faces. We were moved by her and commented positively about all the efforts she is making on always trying to do the right thing. She began to cry from deep within as she said she felt very blessed. We hugged her for a long, long time and said how blessed we also felt. We got her name, address and phone number and told her we would send her one of our books. She said we were like Angels coming into her life. We told her that she was the Angel. She said that the one thing that kept her going was her faith in God because God always made everything all right. Over and over again we have the experience that when we are totally focused on being in the present with another person and look upon that person as if she or he is the most important person in our lives, that healing takes place for all of us. After all, what is a Holy Encounter but a decision to see only the innocence and holiness of another, thereby being able to finally see it in ourselves. It is very easy for any of us to become frustrated with the Course and find it not only difficult to understand but find it also difficult to practice its teachings with diligence, perseverance and trust. There are many students who rather quickly feel the Course is not for them. Then there are others who find that the Course speaks to their heart in a most powerful way never before experienced, and they have an inner knowing that this is their way home. They trust, they persevere, they are committed, they are diligent and they just don’t give up. To them, the Course is not only poetry beyond belief, but is an ancient song that is remembered and awakens them to their own divinity. The Course suggests over and over again that we cannot experience guilt and love at the same time. When we see no value in guilt, we release that guilt and become free. Our egos are very clever at keeping us attached to guilt and at the same time burying guilt deep in our unconscious. That way we are not aware of how long we have carried it and how we still hold on to it. There are times when becoming a workaholic serves the purpose of hiding feelings like these from our awareness. It is our forgiveness that helps us wipe the slate clean when we have that willingness to forgive others and ourselves. And it is in ourselves that most of us find our most difficult challenge. How helpful it is to remember when the Course states that “nothing real can be threatened, nothing unreal exists.” It is reminding us that only Love is real and that guilt is an illusion and does not exist in the “real” world. In our experience God often appears in our lives by coming in sideways and frequently in a surprising way. We have a dear friend named Herb Scheidel who gave us permission to share his story. We think that you will agree that it is quite a remarkable one. We met Herb and his loving and lovely wife, Miyuki, a most remarkable couple, through our dear friend, Henri Landwirth, whom we wrote about in the last issue. Herb is a brilliant, successful businessman. About four years ago, after being in excellent health all of his life, he found that he had cancer of the kidney that had metastasized to several places in his body. He had his kidney and adrenal gland removed. The physicians indicated there was no hope for a cure. Herb had a different belief system than his doctors. He is probably one of the most focused persons we have ever met. He was determined that he was going to live. He read everything he could get his hands on and became quite an expert in his disease. Herb explored all kinds of alternative medical approaches and different diets. His mind is open and he is like a sponge as he takes in new information along the way. He is now one of the longest survivors of the type of illness that he has. Perhaps that is one of the reasons that Herb and Henri have become such good friends because Henri was a survivor also. Shortly after being diagnosed with cancer, Herb had a spiritual awakening and was introduced to the Course. He did not approach the Course lightly and immediately became a very serious student. He is not “sort of” committed to the Course; his commitment is total. Herb told us that he subscribes to The Holy Encounter and finds it most helpful. One of Herb’s alternative therapies for cancer was a visualization/imagery exercise which finishes with Herb imagining himself quite a few years older playing with his grandchildren. This was so Herb could visualize himself quite healthy years from now, having fully recovered from cancer. Herb had developed a habit of reading the Course each morning around 7:00 am, before he did anything else. Upon his third week into the Course, Herb’s reading was interrupted by the Holy Spirit saying “You do not have to heal to experience your grandchildren, because you may already have grandchildren”. When Herb was quite young, his girlfriend became pregnant. Since his relationship was short, he was deeply disturbed about this and was very strong in his way of persuading the near-to-be mother to give up the male child for adoption. Later, they married, but after the birth of another son, the marriage soon ended in a divorce. Herb states that when he heard this message, that he may already have children, he immediately knew what he had to do. First of all, he went into meditation and realized for the first time that it was he who caused the divorce by his previous selfishness. Herb called his ex-wife and asked for her forgiveness for his lack of compassion and love at this critical time in their lives. She immediately stated that she had forgiven him years ago. Herb then asked her cooperation to try to find their child. She agreed and assisted fully in the search. She registered their names at the adoption agency. The search began and it was discovered that their long, lost son had registered his name after the death of his adoptive father, in his attempt to find his real birth parents and, indeed, Herb has three grandchildren, Dylan, Caitlin and Lydia. Then Herb decided to tell his own adult children what had happened. He told them, “When I was quite young I made some serious mistakes that I need to tell you about. I need to tell you that you have a brother that you have never seen” and he then went on to tell the whole story. Herb’s family was delighted and the expanded family have a great deal of love for each other and enjoy their new relationship beyond description, spending Christmases together in Acapulco, going on European cruises and meeting often for vacations or just for the weekend. This family continues to share joy based on the foundation of forgiveness. Part of Herb’s spiritual healing has come from becoming involved in charity work and learning that giving and receiving are one and the same. His compassion for others has increased enormously. Herb and Miyuki helped to build a new home for his ex-wife as a token of appreciation for her forgiving spirit. They are also paying for the education of their grandchildren in a wonderful private school in their community. Among the many things Herb does for others is helping many young people — including children and troubled teenage girls — with full college scholarships. Herb is also on the board of Henri’s organization, The Dignity U Wear and the Habitat for Humanity board in his local community. Herb’s wife, Miyuki, goes into the warehouse and volunteers by helping to sort out clothes at Dignity U Wear. Herb and Miyuki are an amazing example of never giving up hope and making their relationship with God number one in their lives. They know how important it is to live one instant at a time and to place the future in the hands of God. It is not always easy to make a thought like this part of your being when your body is ill, but they are bright stars at reminding themselves each day of this truth. They are lighting up the world with their courage and determination, a world today that seems so often filled with darkness. 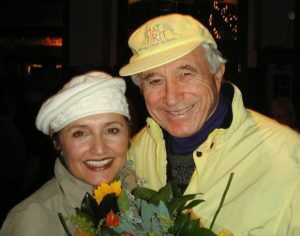 We both feel so blessed to have Herb and Miyuki as our dear friends, our teachers and fellow travelers.